On April 2010, Google have included page load speed also into their ranking algorithm. This means, Now response time of a website is also a factor for page ranking or search result position. Google changed their algorithm because of they just need web authors and webmaster to make a serious look on their webpage's response time. Many thought that contents is more important than anything else. But page load time have also a significant role in thier traffic. The chance of missing a visitor may occur only because their large load time. Page load time is the total time required to load the whole web page. This is depends on the images, scripts and the amount of the content on your web page. While your page takes much more time to load, Its not fare for the development or earnings for your page.The possibility of leaving your site before it loads is very high if it takes more time to load its content. Why Page Load Time is Important? Many web masters and authors very well knows the importance of load time. But they are not focusing on it accurately.This causes missing of many more visits to their page even if it contains most relevant information. While a user searches for some keyword matches to your page, search engines will lists your page also in results. and when they clicks your page, if it takes much time, the possibility of leaving your page is high. So Google introduced a new product, on their developer page, Pagespeed tools. This lets webmasters and authors to check their page loading speed ranking max. of 100. The only thinf u need to do is, just go to this page and check your page load score. If you get a score below 80 or little score indicates more room for improvement. A a high score indicates less room for improvement. 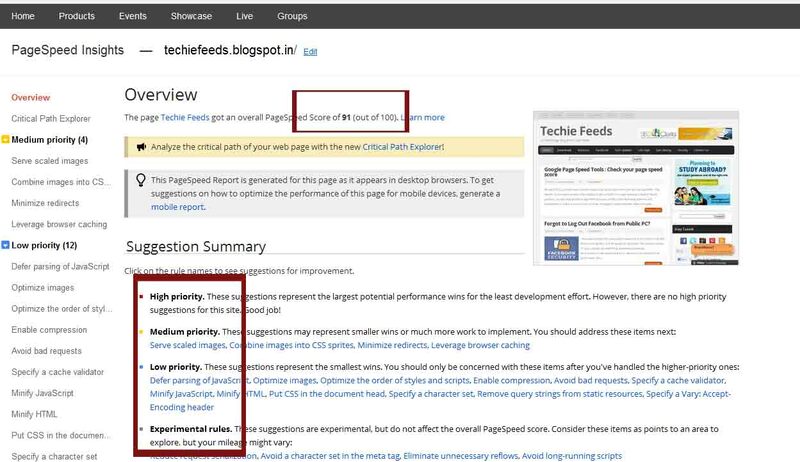 "Techie Feeds" gets 93 out of 100 and we are trying to improve. 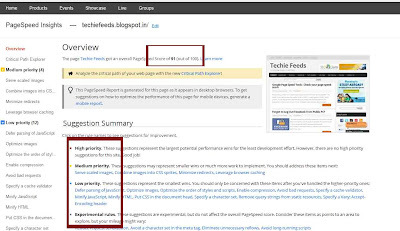 Check whether your content makes your blog slower. It is good that, If add any images, scripts and anything else on your website, compare your current and previously checked page speed scores. If page score becomes low than the score before adding that element, you need to re-size or edit that image or code you added to the webpage for maintain your page speed. You can use Google page speed tool for this purpose.